Roundworms are typically parasitic worms that are often found inside the intestines of living hosts. 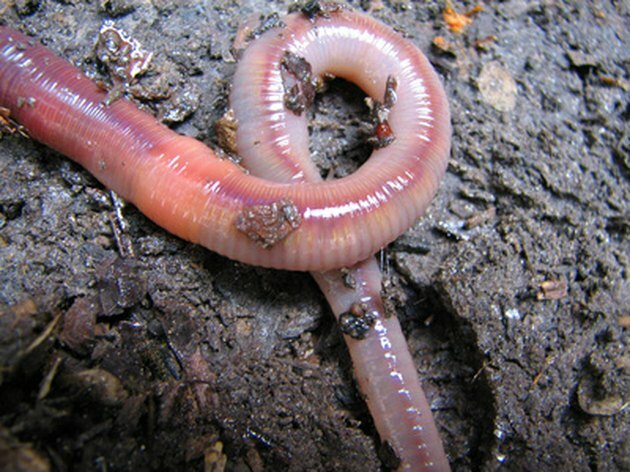 Segmented worms are typically worms found in soil and water. There are several differences between these two types of worms. If you know the right characteristics to look for, it is easy to tell the difference. One of the most prominent differences between roundworms and segmented worms is their circulatory systems. Segmented worms have a complete circulatory system, while round worms do not. A segmented worm's circulatory system includes blood, heart, capillary system and hemoglobin. Roundworms have no hearts or blood vessels. Roundworms use diffusion to breathe and pass nutrients throughout their bodies. The eyes of these worms are also quite different. Roundworms are considered a less evolved form of worm. However, they have a more complicated visual system than many segmented worms. Most species of segmented worms have eyespots. Eyespots are spots on the worm that react to changes in light. When the light moves, it sends signals to the worm to move as well. Roundworms use some of their nerves to detect changes in light. The segmented worm and roundworm have different body types. The segmented worm is made up of small segments. Most segmented worms can be cut into many pieces, and each piece will be able to support a fully functioning life. Roundworms are not like that. Roundworms are bilaterally symmetric, but they actually appear flatter than segmented worms. Roundworms typically will not survive if cut into pieces. Reproduction differs in the two types of worms. Roundworms sexually reproduce. There are both female and male roundworms. Roundworms have sperm and eggs like many mammals. The females lays her eggs in the soil once they are fertilized. Segmented worms have a varied reproduction cycle. Some segmented worms, such as earthworms, are hermaphroditic, containing both male and female organs. When reproduction is necessary, each individual worm can fertilize and lay eggs by itself. Other segmented worm species have male and female worms. Some of these worms are sexually mature at a certain time of year. During this time, they develop bumps on their bodies, which aids sexual reproduction. Some species of segmented worm breed all at once. The eggs take over their bodies, and the babies burst out of the adult worms, killing the adults. Segmented and roundworms also differ in size. Typically segmented worms do not get much larger than 8 to 10 inches long. Roundworms can reach well over four feet in length. Most segmented worms are carnivores. They eat living organisms present in dirt and water. Roundworms usually eat algae, bacteria, protozoa and fungi. Some roundworms and segmented worms are filter feeders, eating the waste of other creatures.